I just came back from Niagara Falls, and my conclusion is the general one. Yes, each side has it’s benefits that makes it just as good as the other side. Instead of comparing the view of the Falls however, I compared what one’s personal preference of environment around the Falls is. If you are a tourist-y person that wants to spend your money (mind you – Canada has 13% tax on everything) and enjoy attractions outside of the Falls, then the Canada side is for you. If you are more of a nature-lover, then the New York side of the Falls is better. The New York side is more like a huge park, with the addition of a Natural Wonder of the World in it. You can take a beautifully scenic walk next to the river before the Falls and even take pictures with your feet in the water where the water is not so rapid. 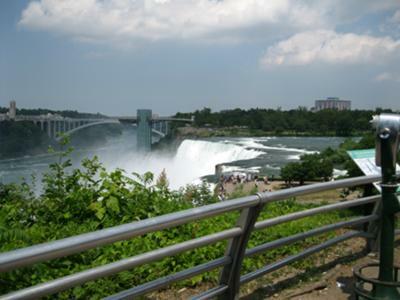 Back to the Canadian side, there are great attractions and so much to do around and about the Falls. There are many hotels in the area where you can stay in a room with a Fall-view room. There are great restaurants and a casino too. In the end, it comes down to your preference of environment. New York side is up close and personal. Canadian side is for the view and then some attractions.